After a 34-year hiatus, Levi Strauss & Co. is back on the New York Stock Exchange, and, so far, the two seem to be a good fit. On opening day, Levi’s share price jumped 32% to close at $22.41. The iconic denim brand’s return comes as rival apparel and footwear company VF Corporation plans to spin off its jeans division — including Wrangler and Lee — into an independent, publicly traded organization called Kontoor Brands, Inc. VR Corporation expects the separation to occur sometime before July 2019. 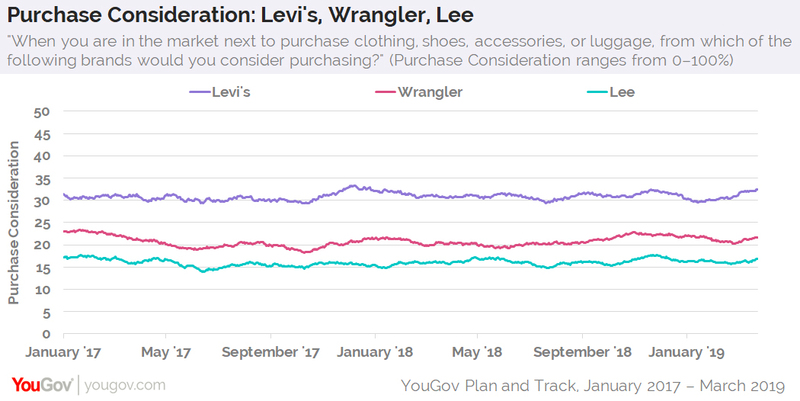 According to the latest data from YouGov Plan and Track, Levi’s currently leads both Wrangler and Lee on Purchase Consideration — YouGov’s metric for potential sales — and has for at least the past two years. 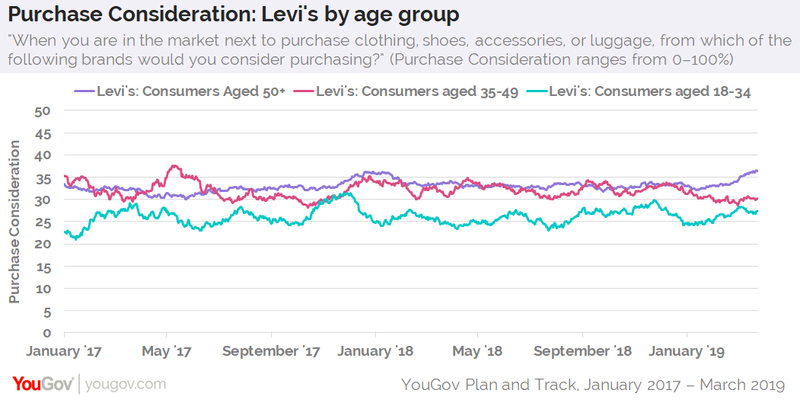 At present, one-third (32%) of US consumers aged 18+ say they’d be open to buying an item from Levi’s when next shopping for clothing, shoes, accessories, or luggage, while 22% report the same for Wrangler and 17% show a similar interest in Lee. At the same time, additional data reveals that Levi’s Purchase Consideration score is stronger among consumers ages 35+ than those ages 18-34. Since January 1, 2017, the average number of US consumers ages 50+ open to buying Levi’s has been 33%. For shoppers ages 35-49, that figure sits at a slightly lower 32%. Among Americans ages 18-34, however, the average interest in purchasing an item from Levi’s between January 2017 and today is 26%. While fashion trends can often be fickle, a growing concern in the world of jeans is sustainability, given the negative impact apparel production can have on the environment. For its part, Levi’s has made an effort to address these concerns by launching various eco-friendly initiatives, such as reducing the amount of water used during its manufacturing process. Some observers think Levi’s commitment to social responsibility is paying off. Wrangler, meanwhile, is lessening its environmental footprint by focusing on sustainable cotton and zero-waste facilities. 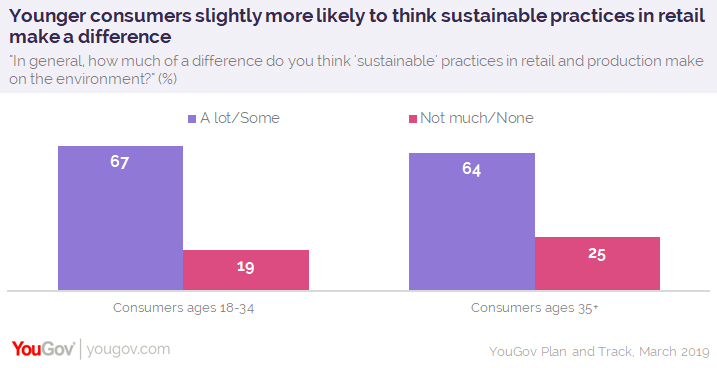 In total, 67% of consumers aged 18-34 believe that adopting sustainable practices in retail make either a lot of difference or some difference for the environment. Only one in five (19%) aren’t persuaded these adjustments help much at all. Consumers aged 35+, on the other hand, are slightly less likely to think sustainable practices have an impact: 64% show agreement, while 25% show disagreement.